Control panel mockup | Flickr - Photo Sharing! Genuine missile status indicator lights, found on eBay. "Missile Away!" "Nuclear Consent" cockpit switch, used in flight simulators. 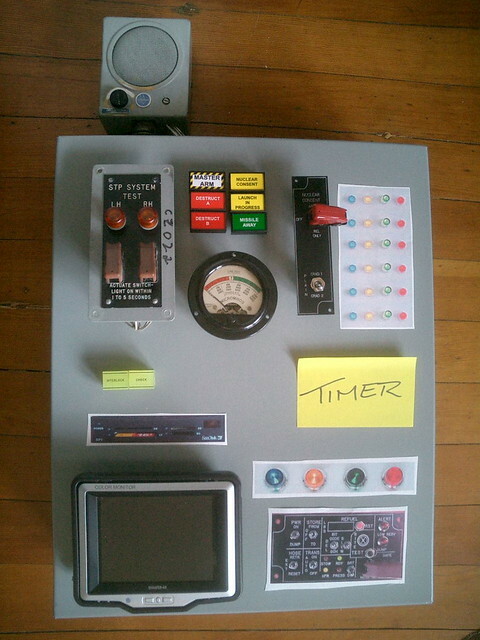 This is a very rough mockup of the Cold War-style control panel I want to build for our kitchen this summer. I'm aiming for a look that's part-Batcave, part-Dr. Strangelove. Some of the parts shown here are real, other are just paper printouts, positioned for size and placement. I've been gathering parts for about 2 years... the next step is to figure out how to wire it all together so it does something... and nothing. feralboy, Matt Fitzwater-Stevens, and 10 other people added this photo to their favorites. Oh, man.. that is so hot. Did you see this watch? I would say it's right up your alley. By far the coolest home remodeling idea I have ever seen. Awesome project. Hope you post a photo of the finished product. I agree with Steve... you could make some profit on this idea. You have one of the coolest homes I've ever seen. I'd love to do some of the things you have done with your home. Keep up the good work. While I'm recouperating, I'll dig around in my junk bin and see if I can find some old 12 volt counters that increment digits when triggered (from the cold war era). So that's what they're called. I've always associated them with electronics from my youth. My dad had one of the first electronic calculators--a big old thing covering the area of a modern tablet PC, but many times heavier. It used nixie tubes for its readout, and the entire device used to fascinate me. I still remember its hot-electronics-and-plastic smell. EDIT: Anybody over the age of 30 or so will know from personal experience what I mean when I say "early electronic calculator." But I recently realized that a lot of adults don't remember the days of rotary-dial phones, 5-channel monochrome TVs and analog records. So, now I describe these things. Speaking of Nixie tubes, check out this entry on the FANTASTIC Finkbilt blog. Lots of info on how to build/use Nixie tubes. Seems like all you guys are into Cold War stuff. In that case, you'll LOVE conelrad.com . Of course we love conelrad.com! I checked out your set of "after" photos for your house (fantastic, BTW), but the kitchen photos didn't show any blinky self-destruct panels. Did you ever have the chance to build this thing? In other words, many of the "zones" I planned to build into the original "all in one" panel have diffused throughout the media rack. 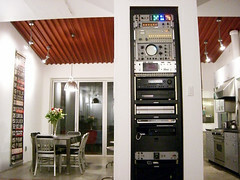 Within the rack, I still plan to scratch-build one panel that will integrate some of the other elements shown above - esp. the old missile launch indicators, shielded switches, and perhaps a small video screen. (it would replace the chrome thing below the oscilloscope in the photo below.) It'll happen... soon. I promise. Really. For the kitchen, I've got a new idea: I want to build a "Cold War Kitchen Timer" -- basically, a small metal enclosure with a burly rubberized keypad on the front, and a big red LED countdown indicator sticking out of the top. It'd work like a regular kitchen timer, but when the timer strikes zero, it would play an audio file of an air raid siren. It's a fun idea, but seeing as how I have no idea how to do the actual electronics, that one might take me a bit longer to figure out! But what is life without silly projects to keep us inspired, eh? Hey I recognize that spare meter! Oh man, these are incredible. I need one for my desk, I don't even care what it does. How come no one makes phones like these? the patron saint of nerds, steve wozniak, has a nixie tube watch!